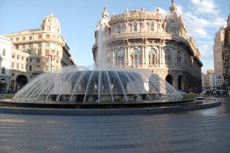 Cradled between land and sea, Genoa is a great place to spend the day. Roam the attractive, sinuous streets of the old town and learn about key places of interest with a guided walking tour. The Portofino Piazzetta marks the main square and central gathering place of the beautiful port town. A great place to find a nice meal, shop at upscale boutiques, or just take a pleasant walk. St. George Sanctuary (Chiesa di San Giorgio, Phone: 0185-269-337): If you're going to be in Portofino in the middle of summer, take an early tender to avoid the heat for this walk. At the western end of the yacht harbor is a trail that has you walking uphill quite a ways (about 15 minutes for a good walker, half an hour for a slower walker). The scenery is absolutely beautiful and the trail is easy. During the Roman period, the sanctuary had a dual role: church and observation fortress. Indeed, the views from here are spectacular, down to the town and to the sea, with the boats and yachts in the harbor and the hills covered in flowers, vines and trees. The church and its fortress are open daily until 7 p.m. The Brown Castle (Phone: 0185-267-101 or 0185-269-046): Just 10 minutes further uphill from the church (via a steep stairway), you come to this crenellated fortress, originally built in the 1400's (and added onto over time) as a lookout over the northern Tyrrhenian Sea and the Tigullio Gulf to protect the region from marauding Turks. Admission is 5 euros (or about $7) and free for those under 13. The architecture and artifacts are worth the price of admission, but the spectacular views are priceless. (Editor's Note: Look for the photos of the movie stars and heads-of-state who have also visited this museum.) Continue up another 10 minutes, through pine forests with well-marked trails, and you will come to the faro, or lighthouse, with a view over the entire promontory and as far as Genoa. Museo del Parco (Centro Internazionale di Scultura all'aperto, Molo Umberto I', Phone: 337-333-737, closed Wednesdays): This outdoor sculpture garden features works from many Italian artists. It's spectacular to see these sculptures while looking out over the yacht harbor and the sea as you stroll up the path. It is an incline, but not too steep; the paths zig-zag as they climb. San Fruttuoso di Camogli: The incredibly gorgeous 10th-century Benedictine Abbey (Abbazia di San Fruttuoso) tucked into a cleft in the cliffs, is worth a visit for the scenery that surrounds it as well as for a glimpse of the church itself. If you start out early enough, you can walk through the national park and over the promontory (about two hours) and take a boat back for 6.50 euros (about $8.25), or you can take the boat roundtrip for 9 euros (about $11.50). If it's not too hot you can walk back too. The Abbey is open daily from May to September, 10 a.m. to 6 p.m. and costs 4 euros (about $5) per adult and 2.50 euros (about $3.25) per child under 12. Rapallo and the Funicular to Santuario di Montallegro (Phone: 018-552-341 or 018-523-9017): You can take a boat from the dock in Portofino to Rapallo for 9 euros (about $11) roundtrip. Then, in the center of town, you can take the funicular, which was built in the 1930's, to the top of the mountain (a seven-minute ride) to see the exquisite 16th-century Sanctuary of Montallegro, 600 meters (1,970 feet) above the town. The funicular costs 7.75 euros (about $10) roundtrip and is open from 9 a.m. to 12:30 p.m. and then from 2 p.m. to 6 p.m. daily. A Day at the Beach: There's so much to do and see in the region that it can occasionally be overwhelming. For those who choose to just relax and rest on a beach and enjoying the Italian Riviera's sunshine, the best alternative is in Santa Margherita, at The Bay of Paraggi, which is the closest sandy beach in the area. And the protected cove and crystal waters are beautiful, too. Bus from the town square in Portofino for 1 euro, (about $1.30) or take a boat roundtrip for 7 euros (about $9.25). Whale Watching: If you are visiting on a Thursday, you are lucky. 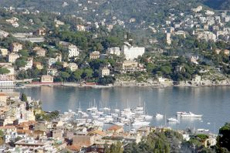 The summer months are when the whales and dolphins play around these waters, in the newly formed French and Italian "Cetacean Sanctuary," and from June to September, you can take a reasonably priced excursion from Santa Margherita Ligure. 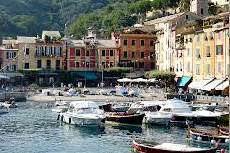 The tours leave at 10:30 a.m., so you have to get an early tender and grab the boat from the Portofino dock to Sta. Margherita (7 euros or about $9.50), and for about 32 euros (about $41) you can experience the whales of the region. Scuba and Snorkeling: Because the waters surrounding Portofino have been designated an underwater national park, the reefs are clean and healthy. Rare red coral grows here, under ideal conditions. Two wrecks are available as dive sites as well. 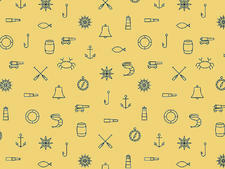 Several companies offer both scuba and snorkeling trips, some in Portofino and some in Santa Margherita Ligure. Prices range from 25 euros for snorkeling to about 75 euros for a double dive. Equipment rental is extra. Some of the companies providing the service are: DWS Diving Center, No Stress Diving Center and Fins and Fans.